Jeff Gordon Says 2015 Will Be His Last Full NASCAR Season : The Two-Way Gordon announced today that he won't race full-time after this year. Now 43, Gordon has been part of competitive racing since he was 5 years old. NASCAR Sprint Cup Series driver Jeff Gordon, left, says he won't race full-time after the 2015 season. 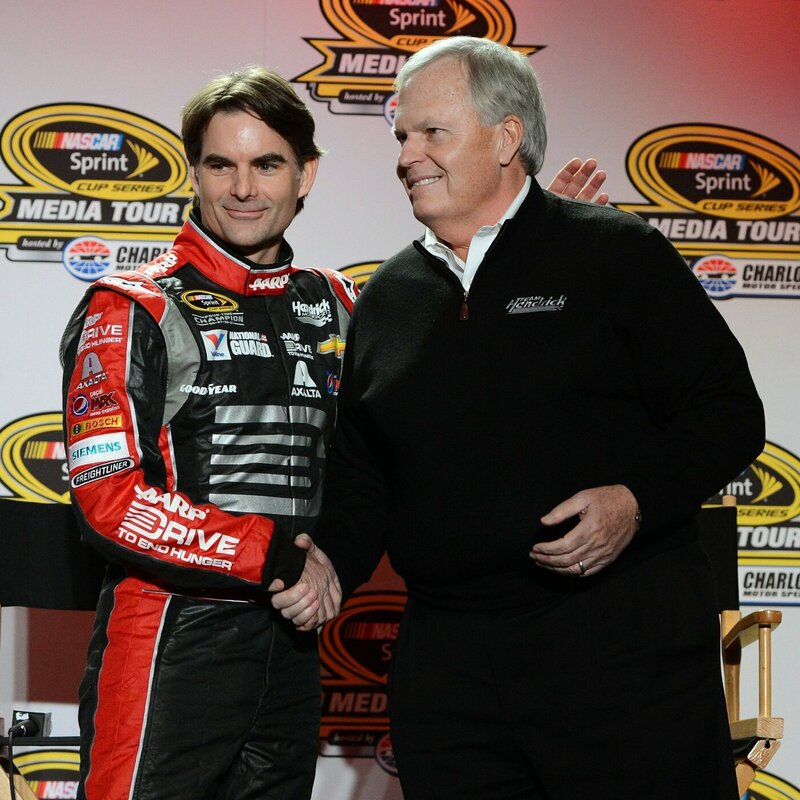 Here, Gordon shakes hands with long-time team owner Rick Hendrick last year. The NASCAR season that begins next month will bring the last run at a championship for Jeff Gordon, who announced today that he won't race full-time after this year. Now 43, Gordon has been part of competitive racing since he was 5 years old. But don't call it a retirement. Gordon says he'll stay involved in both NASCAR and Hendrick Motorsports, the team he's been affiliated with for more than two decades. "I won't use the 'R-word' because I plan to stay extremely busy in the years ahead, and there's always the possibility I'll compete in selected events," Gordon said today. "I don't foresee a day when I'll ever step away from racing." Gordon drove in his first race on NASCAR's premier Cup series in 1992, when he was just 21, in a famous race that was in many ways a changing of the guard. The field of drivers included Richard Petty (in his farewell Cup race), and fan favorites such as Davey Allison, Alan Kulwicki and Bill Elliott. The arrival of Gordon, whose roots are in California and Indiana, helped lift NASCAR from its Southern roots, putting a fresh face on stock-car racing. And he did it in an entertaining way, as half of a spirited rivalry with North Carolina native Dale Earnhardt in which even their team colors clashed, with Earnhardt in black and Gordon wearing colors of the rainbow. "Gordon has appeared on Wheaties boxes and Pepsi ads, serving as a clean-cut ambassador for the sport since he started driving the No. 24 car," NPR's Nathan Rott reports. "Gordon has won every major race a driver can win, and is third all-time on the wins list." At the end of this season, Gordon will have raced in nearly 800 NASCAR Cup races. Of those, he won 92 times — including 13 in one season, back in 1998. Along the way, he captured 77 pole positions and four Cup season championships.